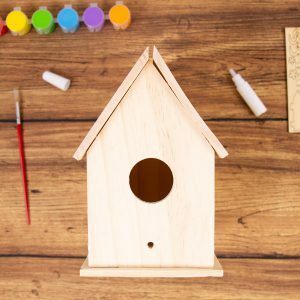 Explore your creativity as you build and design a birdhouse that attracts your neighboring bird and creates a pop of color for your backyard decor. 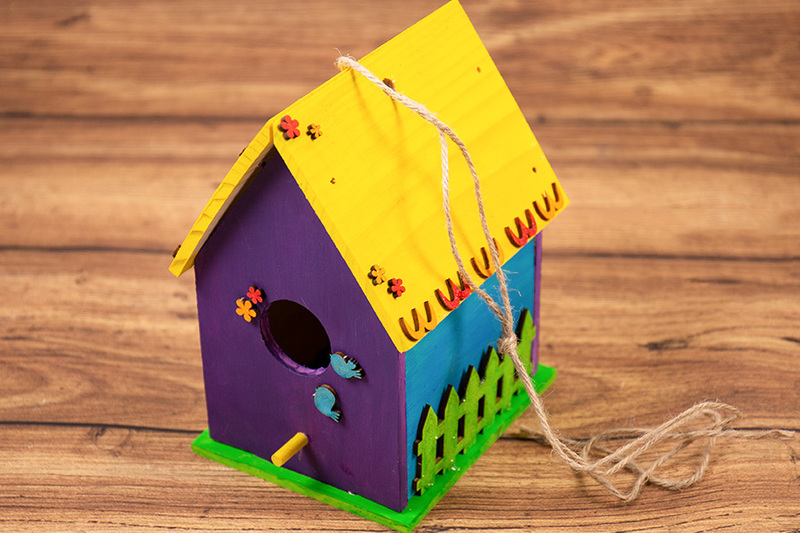 Construct and design a birdhouse to invite your special bird buddies to lounge in your backyard with the Made by Me® D.I.Y. 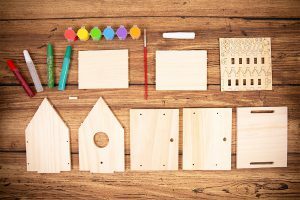 Wooden Birdhouse kit. Use bright colors to attract different types of birds such as red and pink for hummingbirds, orange for orioles, blue for blue birds and more. 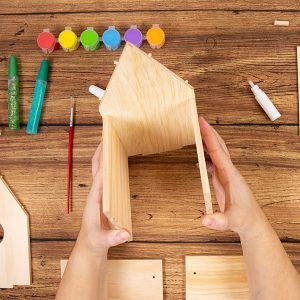 Beginning your construction is a breeze using the detailed instructions and pre-cut wooden pieces. Step 1. Gather your materials and set up your workspace. 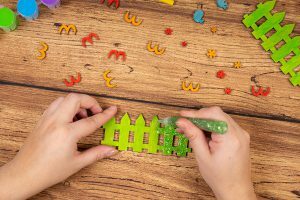 If you want to protect your surface from paint and glue, lay down paper towels, scrap paper or craft paper. Step 2. 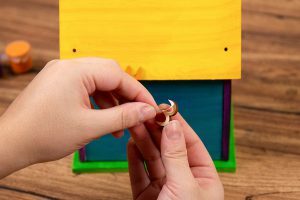 Assemble the birdhouse. The roof pieces are the 2 rectangles with the 4 holes and the base piece is the rectangle with the 2 slots. 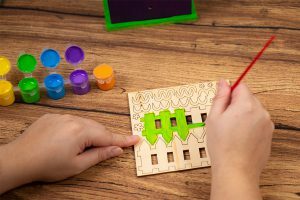 Place small dots of glue in the holes before putting the pieces together to secure. 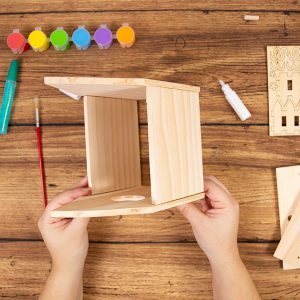 Tip: If you would prefer to plan out your design first, paint each piece before assembly. Step 3. 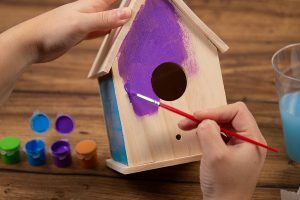 Once your birdhouse is assembled, start painting! Be sure to wash your brush in between colors. Don’t be afraid to get creative! 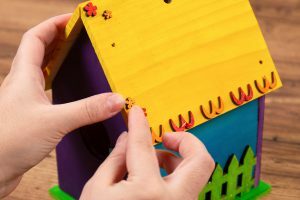 Add different patterns like stripes or polka dots to make your birdhouse uniquely yours. Step 4. 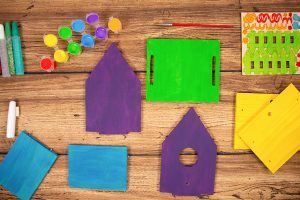 Once your birdhouse is dry, peel off the paper backing and stick them on, wherever you choose. Tip: Add sparkling accents to your design using glitter glue! Step 5. 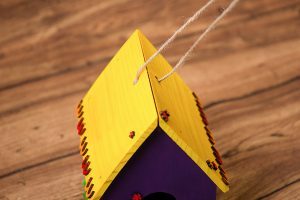 Attach the hemp cording included in the set to hang your birdhouse. 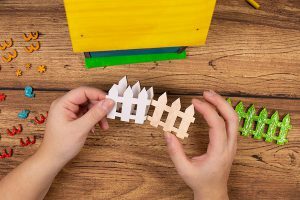 For outdoor display, be sure to spray an exterior varnish to protect your design from the elements.